While I still stand by my intial review of the alpha and beta, I feel like Destiny is the one game that will kill hours and hours of my life. 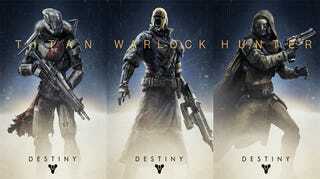 Whether it consists of Strikes, Patrol's, or the Crucible, there seems to be something that makes me want more. Now, this is where it gets tricky. The overall story is very bland and consist of mostly "hold this point" or "hunt this enemy down", and if you don't pay attention to it, the game will just fly by you. The meaning of the missions are very subtle, and if you don't listen to the pre-mission explanations or the chatter of the Ghost, you will miss what in the hell you are trying to do. I am level 24, have played more than 30 hours of the game, and I have yet to finish every story mission the game has to offer. The one aspect of the game I like is the freedom to do whatever you want, and still progress to all of the Strikes and Crucible matches, and not hit a wall that can only be broken through the completion of more missions. The Crucible is broken and unbalanced. The Crucible is perfect. These are the two opinions you will most likely hear from people as they get deeper into it, and at times, they are both true. The matches adjust peoples levels to where a level 24 (me) can still be shot down by level 11 (although I clearly emptied a clip into his head). It offers your basic fare of modes; you have Control, Clash, Combined Arms, Salvage, Skirmish, and Rumble. Out of these, I have only unlocked three of the above listed, and find some of them to be quite enjoyable. Control is the same mode that was available in the beta, which is a capture and hold mode similar to Territories from Halo 2, as well as one of the most rage inducing modes out of the three. The inclusion of your Super abilities makes it incredibly easy to gain/lose a point in the matter of seconds, and makes the match one giant marathon of running from point A to B and then to C, only to redo the circuit again. I gave this mode four matches before quitting and moving onto my current favorite, which is Clash. Clash is your traditional team death match, and in a lot of regards a comfort blanket in the slew of Crucible modes. The objectives are simple; survive and kill the enemies, and in a lot of regards there is nothing special about it. The main draw to it is the chance of receiving better loot with each victory, and still remains the best way of receiving legendary gear. Skirmish is the nail biter of the group, and pits two fire teams of 3 against eachother. A lot of the maps are condensed, but you can still get the drop on your enemies if you are not careful. To me, this one relied heavily on teamwork, and the only way to truly survive was to stick together. A lot of fun, but the matches go by much slower if you play hide and seek. Overall, the Crucible was the one aspect that I didn't care much about, but proves to be a multiplayer I can enjoy for a long time. While I am not a huge PvP fan in general, the possibility of Legendary loot draws me into the training grounds of the Crucible every night. Destiny proves to be one of the better looking titles out currently, and offers a variety of landscapes to explore as you trek across the galaxy. Earth (which is pictured above) offers plains and craggy environments with wide areas for firefights. To me, it seems to be the second most eye pleasing landscape of the planets, right behind Venus. Venus, after much terraforming, has turned into a tropic environment filled with large grassy areas and tall trees that riddle the planet. The majority of the planet is set up in a maze like pattern, and has a lot of tight corridors for heart pounding battles with the Vex. Mars, which is my personal favorite of the four, is a large, open desert with structures plotted across the sand. It is large, and offers a great vantage for those who enjoy sniping enemies. The moon, however, looks like what you would expect from the moon. It was grey, lifeless, and dusty with jagged craters and mountains all around you as you explore the large facilities all across the surface. While it isn't the most enjoyable to explore, I was very excited the moment I first stood on it. Content: In its current state, Destiny does feel... lacking. The amount of content out of the box feels like a fraction of what Bungie wants it to be, and leaves some people waiting for the next batch of updates release. The addition of new modes and missions they are going to implement through weekly updates, which are all going to be free, will be a great way to bide time until the expansions release. Tomorrow does mark the opening of the Vault of Glasses doors, and REQUIRES you to be level 26 just to try it. Leveling: It didn't take a lot of time or effort to get to level 20 in my opinion, and once you reach it you will soon realize it doesn't mean much. You unlock a secondary sub class for your character at 15, and starts you off with a blank slate from the get go. If you look at your characters classes, in reality you have to reach level 54 to max everything out, and not just 20. On top of the normal leveling, to reach the higher ranks you must equip armor with a Light index. Any armor that is blue or higher will start granting light, and combines to make you reach the higher ranks to do the more impossible missions. The jump from level 21 to 22 can take you as long as it did for you to go from 5 to 10, and requires more grinding than some are willing to do. Chat: While it isn't that big of an issue for me, a lot of people are wanting proximity chat when they are not in a fire team. It feels like something that should be implemented for a game that requires cooperation, especially if your friends aren't online at that moment. Even though it feels lacking right now, and has some hiccups, Destiny is the game I was hoping for. It is well worth the $60 price tag, especially when compared to games like Call of Duty and Battlefield, and will only grow with time. If you haven't picked it up yet, I suggest that you do, or wait for a used copy to see if you is your cup of tea. For me, I need to coordinate with my clan to see how exactly we will conquer our next level 24 strike. Until then, I will see you star side, Guardians!